Robert Mitchum: "Baby I Don't Care"
One of the movies' greatest actors and most colorful characters, a real-life tough guy with the prison record to prove it, Robert Mitchum was a movie icon for an almost unprecedented half-century, the cool, sleepy-eyed star of such classics as The Night of the Hunter; Heaven Knows, Mr. Allison; Cape Fear; The Longest Day; Farewell, My Lovely; and The Winds of War. Mitchum's powerful presence and simmering violence combined with hard-boiled humor and existential detachment to create a new style in movie acting: the screen's first hipster antihero-before Brando, James Dean, Elvis, or Eastwood-the inventor of big-screen cool. Robert Mitchum: "Baby, I Don't Care" is the first complete biography of Mitchum, and a book as big, colorful, and controversial as the star himself. 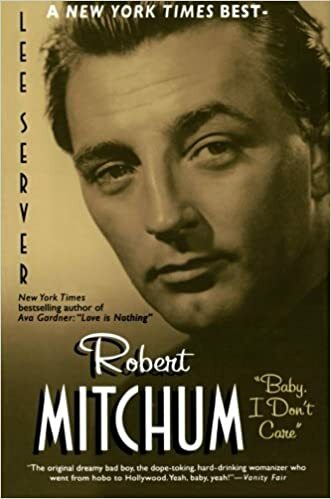 Exhaustively researched, it makes use of thousands of rare documents from around the world and nearly two hundred in-depth interviews with Mitchum's family, friends, and associates (many going on record for the first time ever) ranging over his seventy-nine years of hard living. Written with great style, and vividly detailed, this is an intimate, comprehensive portrait of an amazing life, comic, tragic, daring, and outrageous.